SXSW is almost here, so here's an overview of Isobar's on-the-ground activities so you can work us into your schedule! In addition to our official involvement, Isobar will be sending a team to keep our people and clients up to date with all the latest trends. Tune into the Isobar U.S Blog, and Isobar's social channels throughout the conference to find out in real time. First up in our schedule, in a MediaPost @ SXSW session, Jenessa Carder Associate Communications Strategy Director, Isobar US will be joining a panel to discuss whether "Marketers Need an AI/ML "Strategy"? James Lanyon (T3), Whitney Fishman Zember (Wavemaker), Eric Perz (Marc USA) & Kate Rush Sheehy (R/GA) will join Jenessa in discussing how nothing is brighter and shinier an object in 2018 than Artificial Intelligence/Machine Learning. But do all brands really need to rush in? The team will explore how marketers resist the smoke and mirrors around these hot topics and discover how these technologies apply to their own marketing goals and infrastructure. 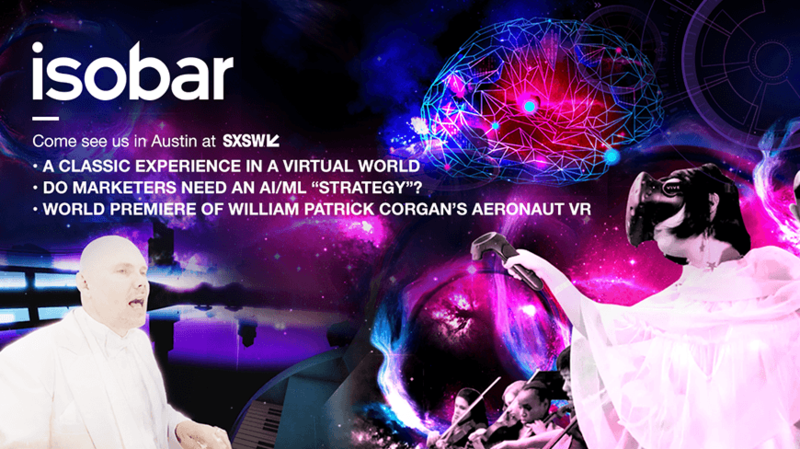 Saurab Bhargava Digital Strategist & VP Isobar US, Teek Mach (TiltBrush Artist), AllenTeinkham (Chicago Youth Symphony Orchestra) will be holding an official SXSW session on Art & Tech: A Classic Experience in a Virtual World. In this session, pioneering artist, Teek Mach (Smashing Pumpkins), and one of Chicago’s most inspiring classical music directors Allen Tinkham sit down with digital expert Saurab Bhargava to discuss their ongoing collaboration between music and painting in virtual reality, and the evolving landscape of classical music, encouraging the audience to question, How can we use emerging technologies to provide new avenues for the modern audience to engage with and appreciate classical music? We will be hosting a film screening of the World Premiere of Aeronaut VR, one of the first music experiences to feature a hologram created with Microsoft Mixed Reality Capture. This technology was used to capture Billy Corgan’s performance in volumetric video, while incorporating innovative technologies from Google and Unity. This content was created inside a 3D world that was imagined by San Francisco artist and filmmaker, Danny Bittman and brought to life by the teams at Viacom NEXT and Isobar. By capturing Corgan’s three-and-a-half-minute performance in volumetric video at Microsoft’s Mixed Reality Capture Studios, Viacom NEXT, Isobar and Bittman, were able to use Tilt Brush and Unity's creation engine to build a world around him.